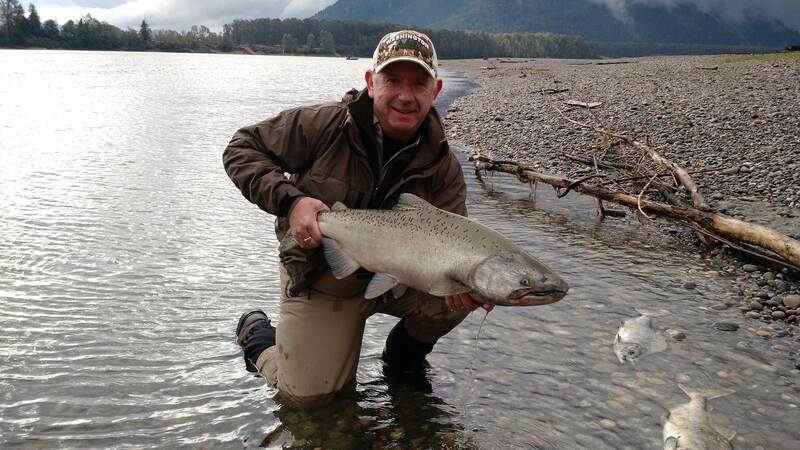 A Thompson Steelhead passing by on it way home, caught while Bar Fishing for salmon on the Fraser River this week. Large schools of salmon are now migrating up the Fraser with each high tide, the main species migrating are Chinook, Coho & Chum Salmon. As mentioned above, these fish are heading to their home waters on the Stave, Dewdney, Vedder, Harrison and Chehalis rivers. 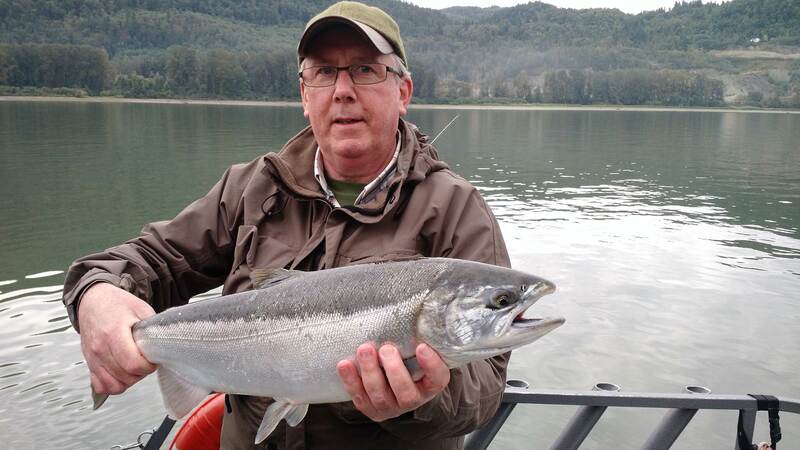 If you are fishing the main stem Fraser, you can target these fish with several methods. Bar fishing with Yakima Bait Spin n Glos or GibbsDelta Tee Spoons are very productive, we prefer using #2 spin n glos in the half n half, or chartreuse poke a dot. If your using Tee Spoons, Chartreuse blade or chrome/brass work well. 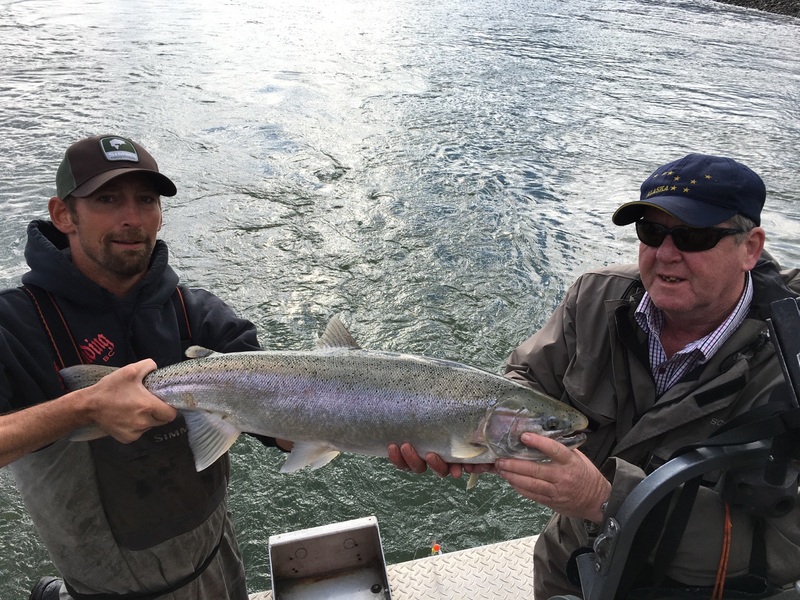 If your fishing the Vedder, Stave or Chehalis, try traditional float fishing with cured roe, single egg/wool patterns or purple/chartreuse/pink maribou jigs. One of my favorite is float fishing with Colorado blades, use the same set up as you would if you were float fishing with roe except exchange the cured roe for a small #2 GibbsDelta colorado blade, dead drift the blade same as you would roe, change nothing except as you drift through the tail out of the run, add a little thumb pressure to the reel to raise the blade off the bottom and add blade speed. 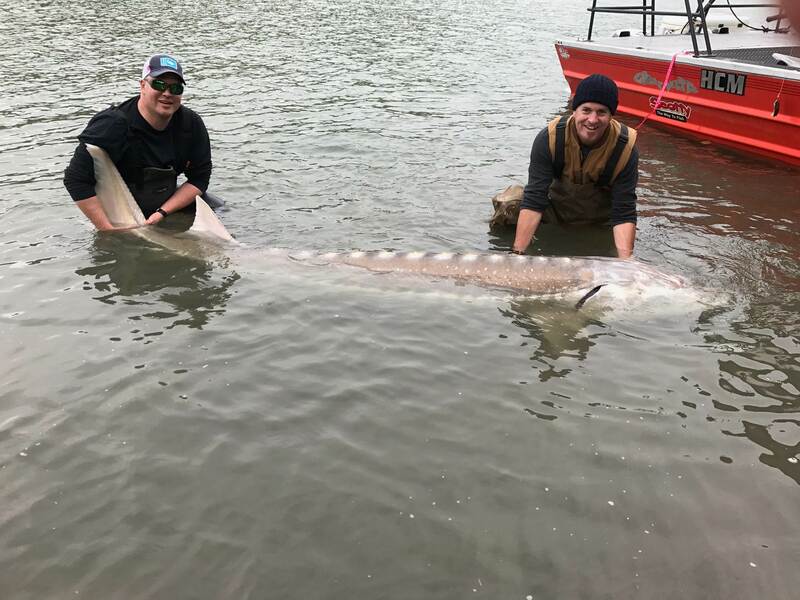 Sturgeon fishing has been excellent for the most part, the odd slower day but overall some incredible catches by our guests the past few weeks. Sturgeon fishing will not only remain this good, it will even improve as we get into November. Some of our best days happen between October 21 & November 15, reason you ask? Water temperatures are beginning to drop, lots of food in the river as salmon begin to spawn, die and deposit massive amounts of decaying matter on the river bottom. 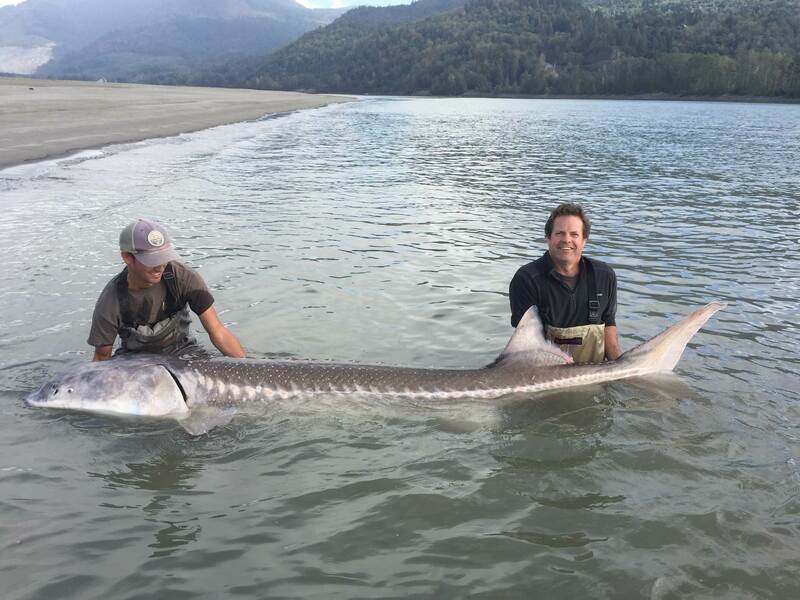 Sturgeon fishing on the Fraser River is a world class fishery, the area between Harrison River and Stave River is some of the most productive water to fish because of the mass amount of food available to sturgeon. Our trips depart daily from Mission, Chilliwack, Harrison and Hope. There is still lots of great fishing ahead of us and to celebrate what we consider primetime Fall fishing, we are offering some great discount specials for November/December. There is still plenty of great fishing ahead of us, come join us. Come join us for some of the best fishing of the season and save hundreds of dollars. Book any 2018 Fishing Trip before December 1 and receive FREE STS SWAG. Its that time of year again when Blad Eagles from around North America begin migrating to their winter feeding grounds on the Harrison River. Thousands of Bald Eagles spend the winter in the Fraser Valley pearching high amoungst the cedar and fir trees waiting for their opportunity to drop down and feed on dieing and dead salmon. 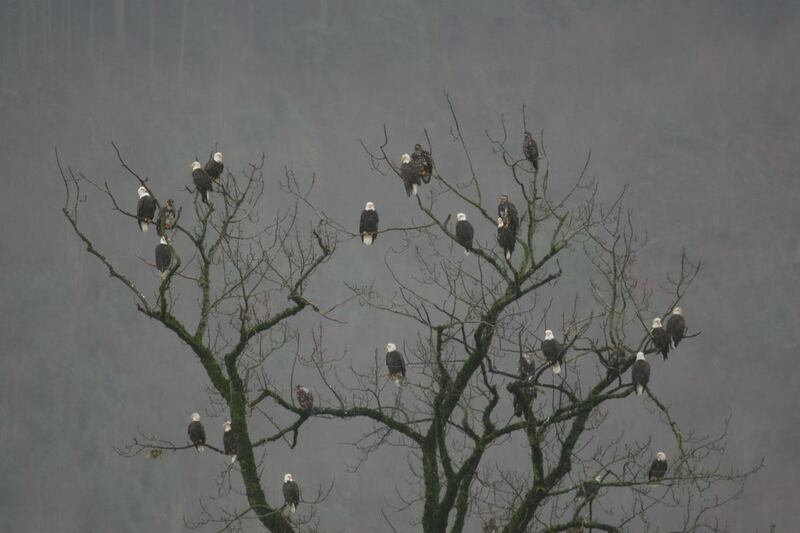 It is a special time on the Harrison River as many of these eagles will feed daily in the area known as Pretty Flats. Our jet boat tours visit this and other important feeding grounds where you will see many Eagles. This Tree is located on the Harrison River half way between Kilby Park and Harrison Hot Springs Resort, only accessable by water, our scenic tours visit this location on every tour. Bald Eagle Tours on our fully covered and heated jet boats are now available, departing daily from Harrison Hot Springs, this 90 minute tour visits some of the most prolific Bald Eagle Feeding ground found anywhere in SW BC. All ages are welcome.